*Anyone* who suggests otherwise is just wrong. Economic sanctions. Withdrawing military support. Defunding the largest public health organization in the world. This is what the U.S. delegation to the World Health Assembly threatened to do to ally nations if the organization passed a resolution that would encourage member governments to do the unthinkable: support breastfeeding infants when possible. Yes, we’re talking about breastfeeding, something that humans have been doing, well, as long as we’ve been human. 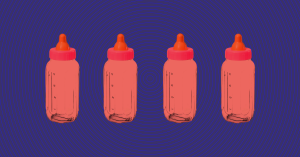 In doing so, the Trump Administration flew in the face of decades worth of science demonstrating that breastfeeding newborns and infants promotes health in ways that formula or powdered milk cannot. At the May meeting, every other member nation of the World Health Organization (WHO) supported the measure, which included the phrase “protect, promote and support breast-feeding.” But the U.S. managed to stall the entire process, according to The New York Times, until Russia reintroduced a version of the proposal, which the Trump Administration chose not to challenge. What research are they talking about, exactly? Well, there’s been a lot. An exhaustive and exhausting body of scientific research conducted over the past 40 years shows that breastfeeding children promotes a healthy immune system and microbiome, both of which are linked with improved health outcomes. In 2016, a series of major studies concluded that universal breastfeeding may have prevented the early deaths of about 823,000 children and saved the world $300 billion. All these studies point to one conclusion: kids who breastfeed are healthier. And encouraging breastfeeding could do wonders for public health. Research over the past 40 years shows that breastfeeding children is linked to better health. That’s part of the reason that the World Health Organization advises governments to prevent companies from directly advertising formula to mothers. Yet, as the Guardian reported, companies such as Nestlé, Abbott, and Mead Johnson often do just that, in the U.S. and elsewhere around the world. Sometimes those companies dance around the borders of the WHO guidelines, sometimes they flagrantly violate them. When companies advertise formula to families and doctors in impoverished areas, mothers sometimes have to choose between buying food and buying formula for their babies. Meanwhile, a major study published this spring compared Nestlé’s presence in low-income countries to infant mortality and found an increase of 9.4 infant deaths per 1,000 births in areas where formula was heavily marketed. The main factor, the researchers learned, was that formula is being advertised and promoted in areas where mothers don’t have access to clean water. Instead of breastfeeding, these mothers are being made to believe that formula is the better choice for their children, who are then consuming water-borne pathogens along with their powdered milk. The scientific evidence seems pretty unequivocal. So you, like all the other stunned representatives present at May’s World Health Assembly, are probably wondering: Why did the U.S. delegation oppose this? The New York Times notes that there’s no direct evidence that the baby food industry — those that make something like $70 billion every year selling powdered milk — was involved in the U.S.’s decision-making. But, as Spectrum reported, these companies donated to Trump’s inauguration and it is likely that their financial interests were considered more important than distributing accurate information on child healthcare. President Trump has already criticized The New York Times’ coverage of the World Health Assembly. On — yes — Twitter, he repeated the U.S. World Health Organization delegation’s claim that the proposal to promote breastfeeding would be a disservice to mothers who, for one reason or another, cannot breastfeed. Let’s fact check that for a sec. Yes, lots of mothers cannot breastfeed. Some choose not to for reasons that are up to them. Couples adopt children and rely on formula during the early years. That’s all completely OK. Breastfeeding comes with added health benefits for babies, but formula feeding is a perfectly fine alternative to breastfeeding — one that won’t harm a child. But there’s a difference between making that caveat and threatening ally nations to drop a proposal that would improve public health around the world. The Russian delegate who reintroduced the pro-breastfeeding proposal, as The New York Times reported, said, “We’re not trying to be a hero here, but we feel that it is wrong when a big country tries to push around some very small countries, especially on an issue that is really important for the rest of the world.” Today, that blackmailing bully is the U.S. And luckily for families worldwide, the delegation did not succeed.